Paris Jackson, Michael Jackson’s daughter, used her moment introducing a performance by Daft Punk and The Weeknd at Sunday night’s Grammy awards to speak out against the Dakota Access pipeline. The moment, which came shortly after Jennifer Lopez opened the show by quoting Toni Morrison, was an early indication that the stars of the night were going to use whatever platform they had to get political. Earlier Paris Jackson joined thousands in a Standing Rock NoDapl march. Based on the reports, the only daughter of the late Michael Jackson was showing her support for the Standing Rock Water Protectors against the Dakota Access Pipeline. Jackson is indeed one fearless gal as she expressed her thoughts over the Dakota and Keystone pipelines. According to Daily Express, thousands, including Jackson, were protesting the construction because they believe the project will be a threat to the Standing Rock Indian Reservation’s clean water supply. In an Instagram post, Jackson shared a video showing the demonstration in Los Angeles on Sunday. Following the march, Jackson was spotted at a gas station while running some errands. 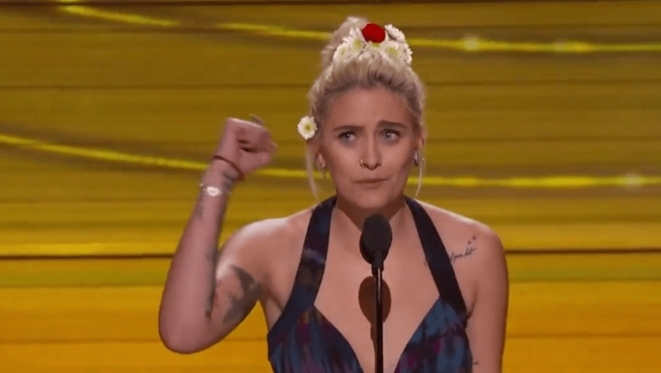 Responses to "Michael Jackson’s daughter just used the Grammys to protest the Dakota Access pipeline"